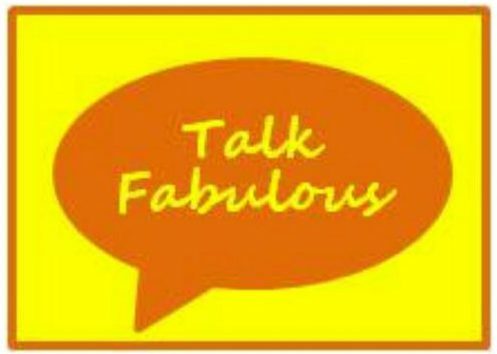 Today, let’s talk successful failures. Yes, there’s such a thing as a successful failure. Today’s outfit recreation is the prime example. 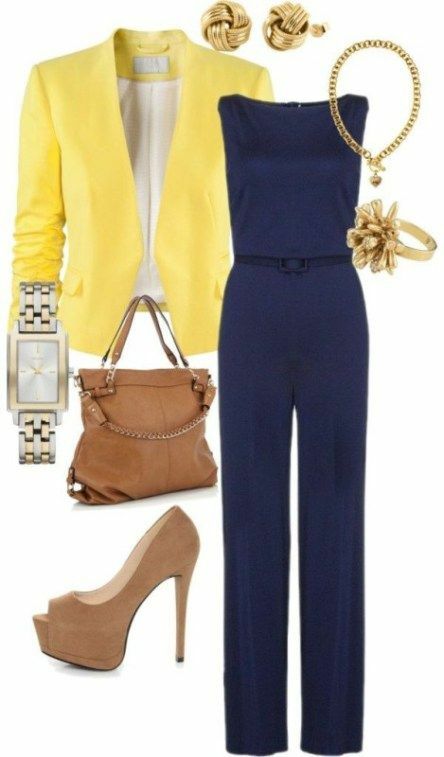 My first thought looking at the inspiration photo was to recreate the outfit by switching the yellow cardigan for a navy cardigan and wearing the yellow as a top. That did not go well. My skin tone does not lend itself to yellow at all and this was no exception. I probably should’ve known better. It’s never a bad idea to revisit things that may have not worked in the past. Who knows? It might work now, right? Sometimes, but not this time. I quickly came to grips that yellow and I don’t get along and moved on. 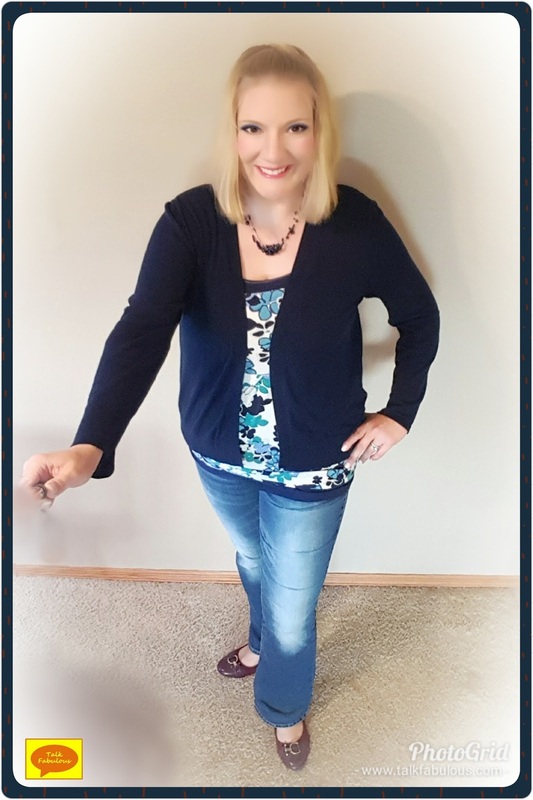 I wanted to keep the idea of my navy cardigan, so I scoured my closet for a top that would work. Lo and behold there was a top just waiting for such an outfit. 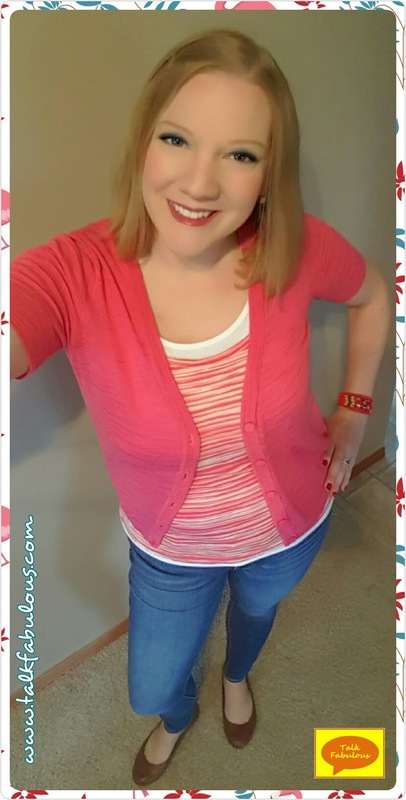 I purchased this top from ThredUp a couple months ago and hadn’t worn it yet. I was so excited it worked with this restyle and I’m loving this look for fall! What color are you loving this fall? Today, let’s talk realizations. Every now and again, we all have those “Aha” moments. You know the ones. The times we discover something new about ourselves. I had such a moment a few weeks ago. The hubby and I were getting ready to go meet some friends at a winery for some drinks and live music. It was nothing fancy; just a casual night out. As I was finishing up my makeup, I realized I had gone a little overboard. I thought to myself, “Well, there’s nothing I can do about that now without starting over, so I’ll just go with it.” Next, I walked over to my armoire to add the finishing touches to my outfit. On went a few bracelets, some fancy earrings, rings, and necklaces. I walked over to the mirror and laughed out loud. It was at that moment I realized that I have no subtle button. It’s go big or go home. This was especially funny as I’m in my mid-thirties and have been like this since I was a kiddo. It’s true, just ask my mom, she has stories. I probably should’ve made this realization earlier, but it doesn’t really change anything. I’m still going to go all out all the time. Today’s outfit is no exception. When I saw the inspiration photo, I couldn’t wait to recreate the look and pile on as much gold jewelry as possible. 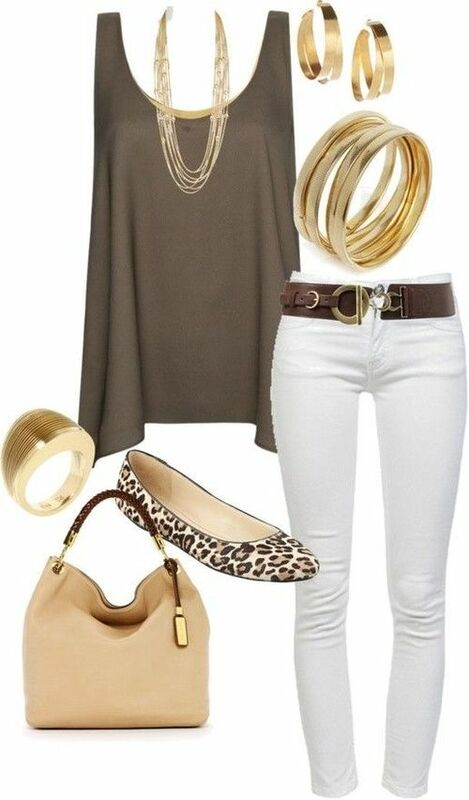 Just like the inspiration photo, I paired some white jeans with a brown tank and a mustard colored tank underneath. I never would’ve thought of that color combo, but I’m loving it. I also did indeed add as much gold jewelry as I could and finished off the look with metallic brown sandals. To be honest, I wasn’t sure I was going to love this outfit, but I ended up really liking it. This will definitely go into my summer rotation! Do you have a subtle button or do you like to go all out all the time? Ah, it’s good to be back! Today, let’s talk surprises. One of my most surprising thrift store finds has been this white pair of jeans. I never would have purchased them had it not been for my Halloween costume last year (see it here). Turns out, that was a great choice as these jeans have really opened up my spring and summer wardrobe possibilities. Plus, they fit like heaven! For the restyle, I stuck pretty close to the inspiration photo. 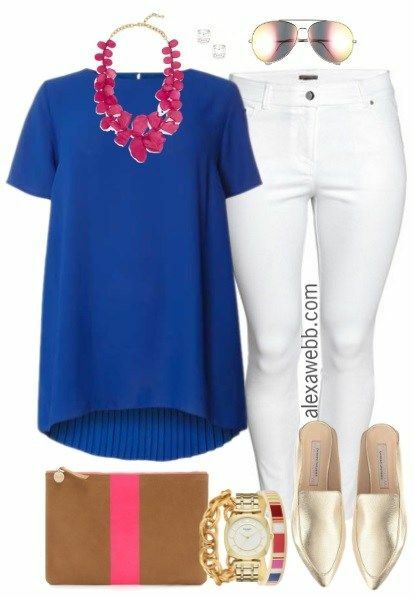 I love the blue with the pink accents and white jeans. 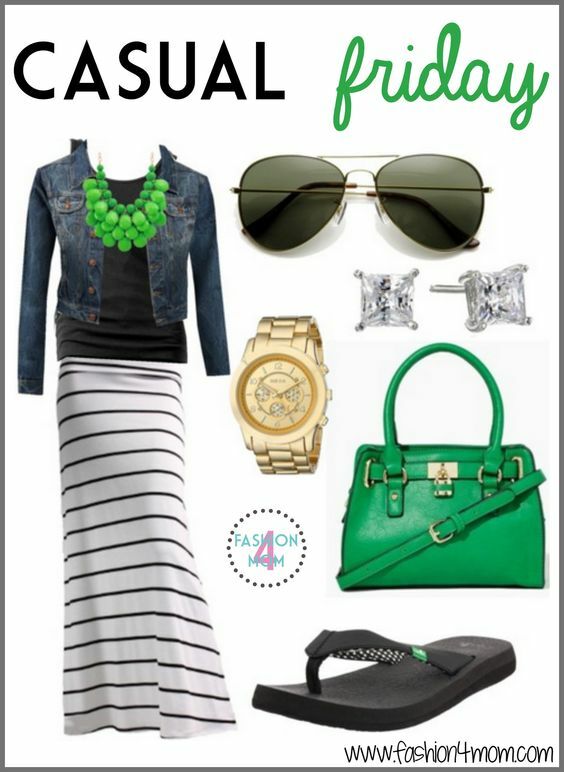 It’s such a chic look and one that’ll be on repeat this summer! 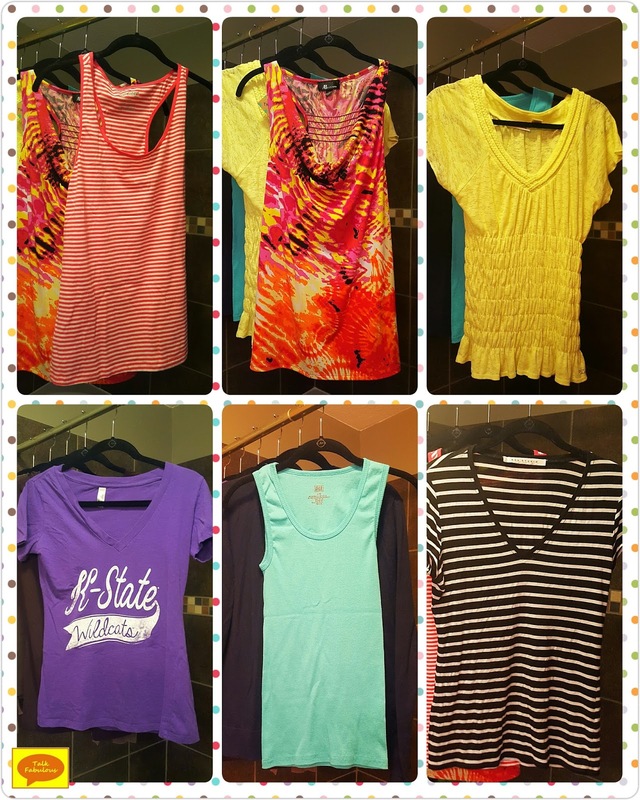 What clothing purchase has most surprised you? 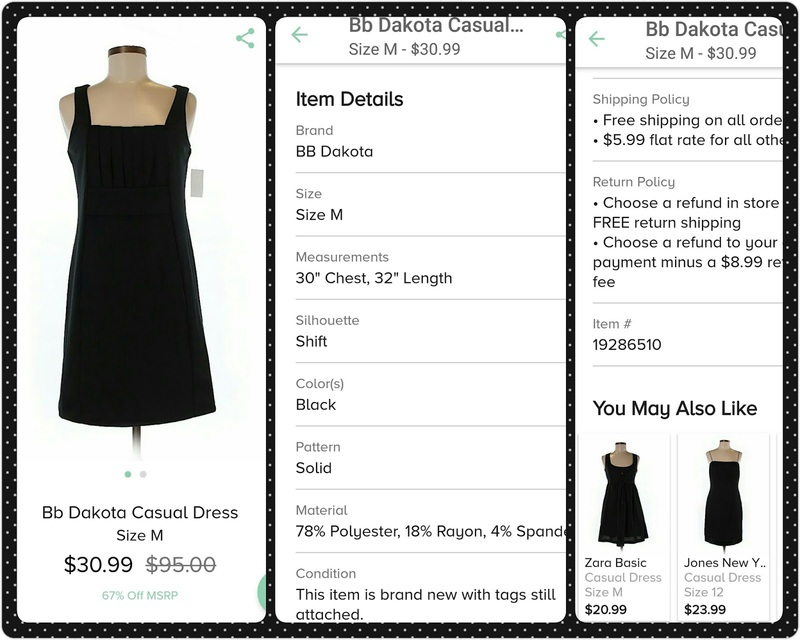 My First Purchase from thredUP! As I mentioned, I started off on a quest for jeans. I ended up with 4 pairs in my cart, 2 from Old Navy, 1 from Tint (which I’ve never heard of or tried), and 1 from Christopher & Banks. 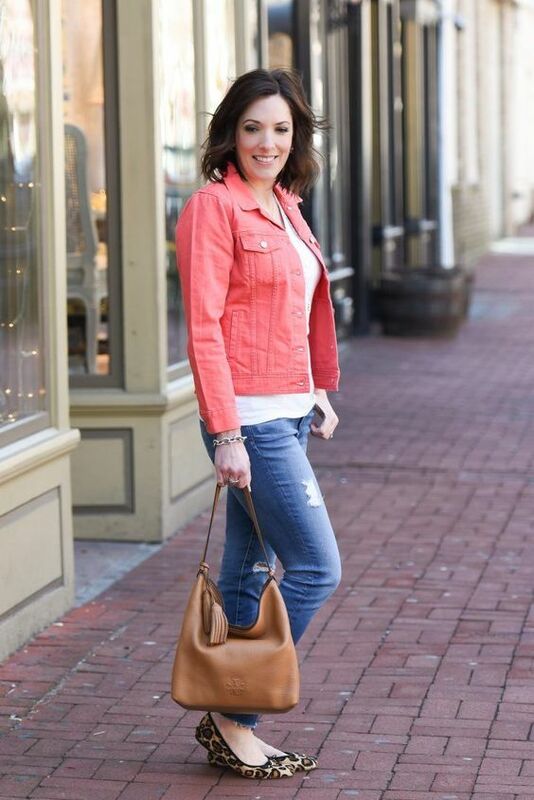 I used to love Old Navy jeans, but I might be too old for them now. Neither pair fit me at all nor did the Tint jeans. The Christopher & Banks jeans fit really well, but they were too short. I’m definitely keeping my eyes peeled for another pair of those but in a longer length. I have been searching for a jean skirt for quite awhile now, so I started browsing through those options. I found a super cute skirt from Old Navy and luckily it fit well! I love it and I’m so happy to have a nice jean skirt again. See it in a post here. 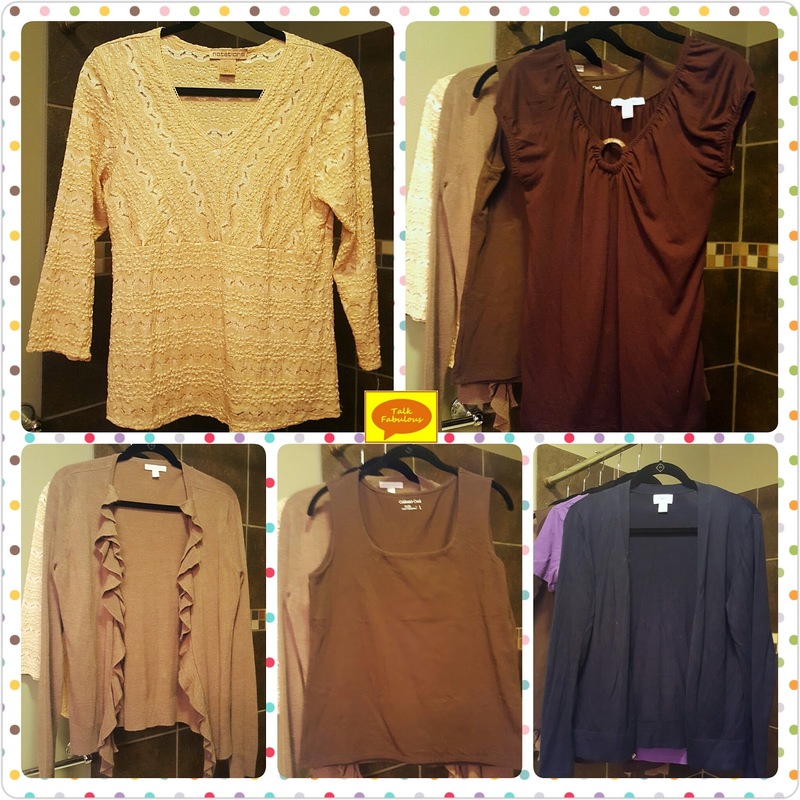 All the pieces on the right found new homes in my closet. I was pleasantly surprised at the number of pieces I wanted to keep. Normally, I’m sending back probably 25% of my online orders. This time I really did good! The brown shirt on the top right I talked about in a post here. Let’s talk about the Old Navy sweater on the bottom right. I LOVE these sweaters! I was first introduced to these sweaters by receiving one from my dad and stepmom for Christmas one year (see posts here and here). The fit of these is so perfect and so cute. They are also lightweight and yet still keep you warm. I have since found one in white from Goodwill and now this one in navy blue. If I can find these in all the colors, I will scoop them up in a heartbeat! 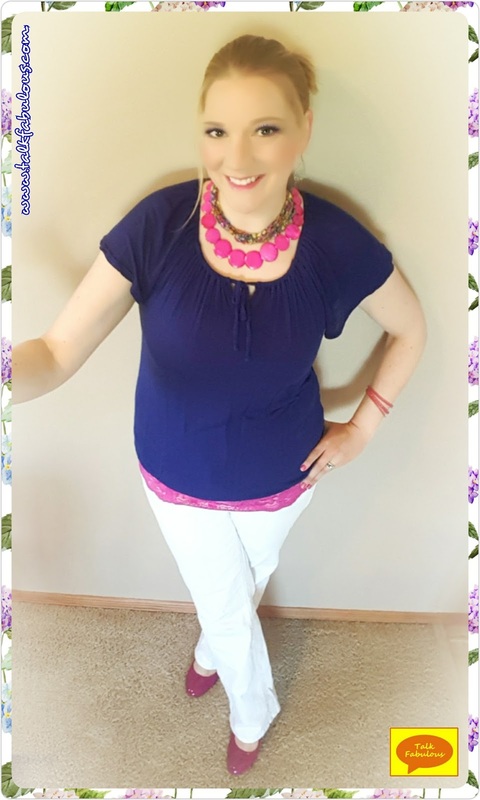 If you’ve been contemplating trying thredUP, I would highly highly recommend it! It’s so cool that these items are getting a second chance and a new life. Plus, who doesn’t love shopping from their couch, right? If you’re interested, feel fee to use my special invite link here, which gets you $10 to spend. Enjoy! I’ve been on a quest for a black and white striped shirt for at least a year. I could never find one that I loved. I tried to make up for this by getting a gray and white striped shirt and even a pink and white striped shirt. While I love those, I still longed for a black and white one. Well, thredUP to the rescue! 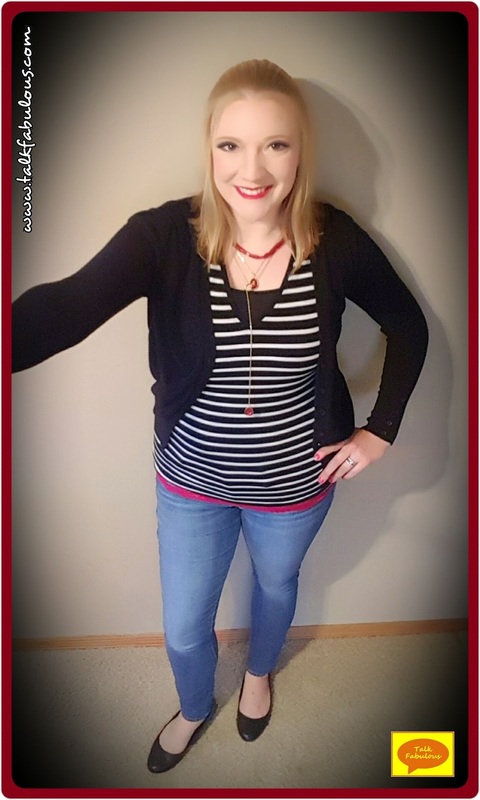 My search for a black and white striped shirt ended when I found this number on thredUP. It’s the brand Max Studio, which I’ve never tried before. Guys, this is the softest t-shirt I’ve ever felt. It’s so nice and the cut is really flattering. This is definitely a brand I will seek out more often. Now, onto the outfit details! I love the pink sweater with the black and white shirt in the inspiration photo. The pink sweater I have was not quite bright enough to look nice with the shirt. 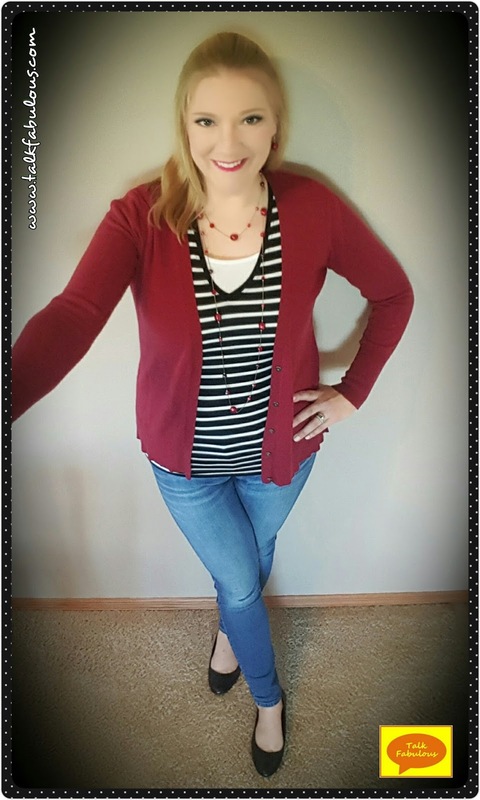 Instead, I opted for a dark red sweater complete with a matching red beaded necklace. This was a quick, simple, and super chic look that I’m loving. I can’t wait to find more ways to wear my new black and white striped shirt! 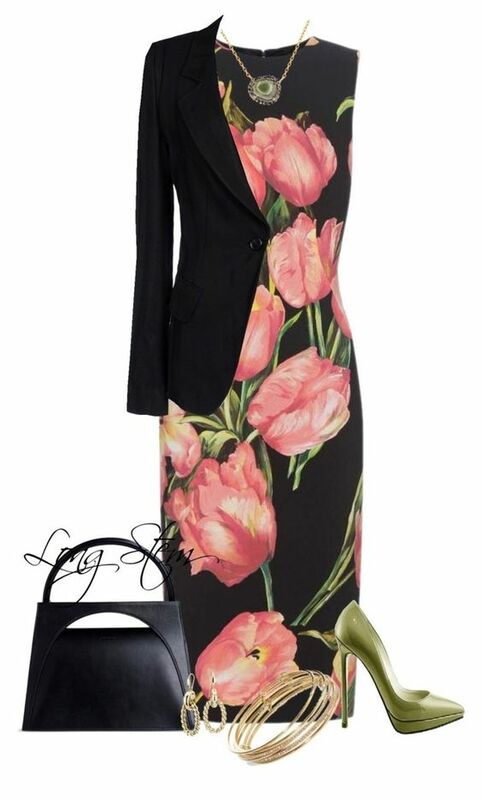 What pieces have you been searching for lately? 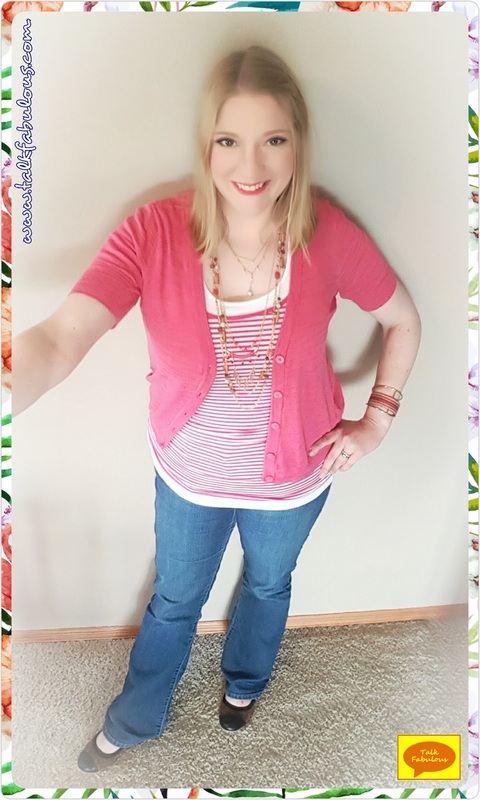 For today’s Fabulous Finds Friday, let’s talk about thredUP. 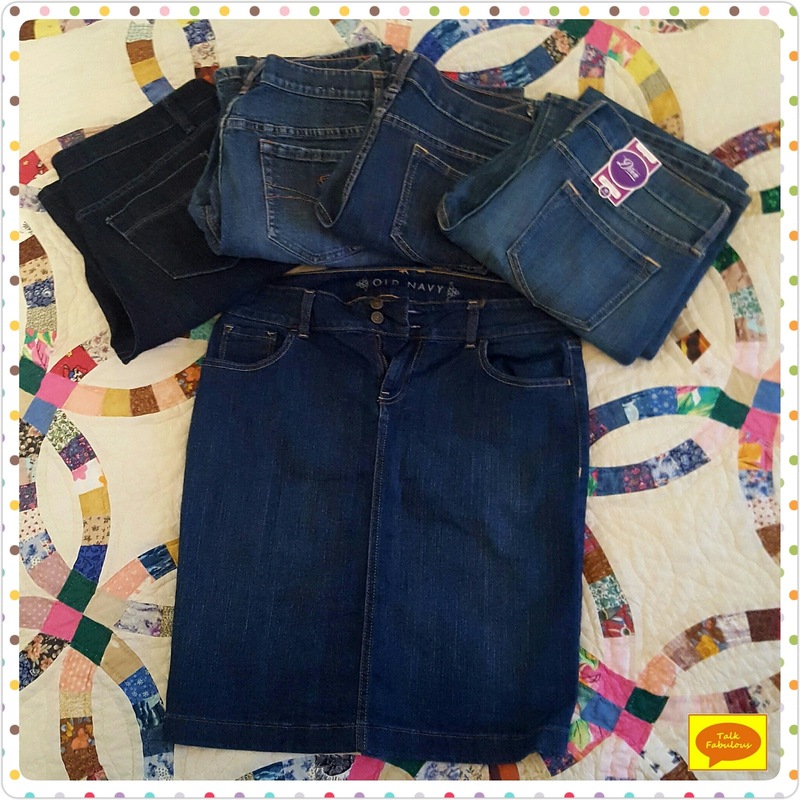 ThredUP is basically an online thrift store. The company buys used clothing and sells it to you for a deeply discounted price. It’s like sifting through the racks of Goodwill from the comfort of your couch! Sounds like fun, right? It is! You do have to sign up to even browse their website or app, which is a little odd. That actually kept me from trying it for awhile. It is worth it, though. Plus, they send you coupons and deals, so it’s not all bad. You even get 40% off your first order! Typically free shipping starts at $79 and they often have days when the shipping is free. Otherwise, they have a flat shipping rate of something in the range of $5-$6. Returns are free for store credit or $8 to be reimbursed with the original method of payment. You can also sell your clothes to them, but from the online reviews, it doesn’t sound like a good deal at all. There were a lot of negative reviews around the selling of clothes. If that’s something you would be interested in doing, I would recommend doing a little more research. There’s a little background about the company. Now let’s get into the shopping! The great thing about the website and app are the filters. 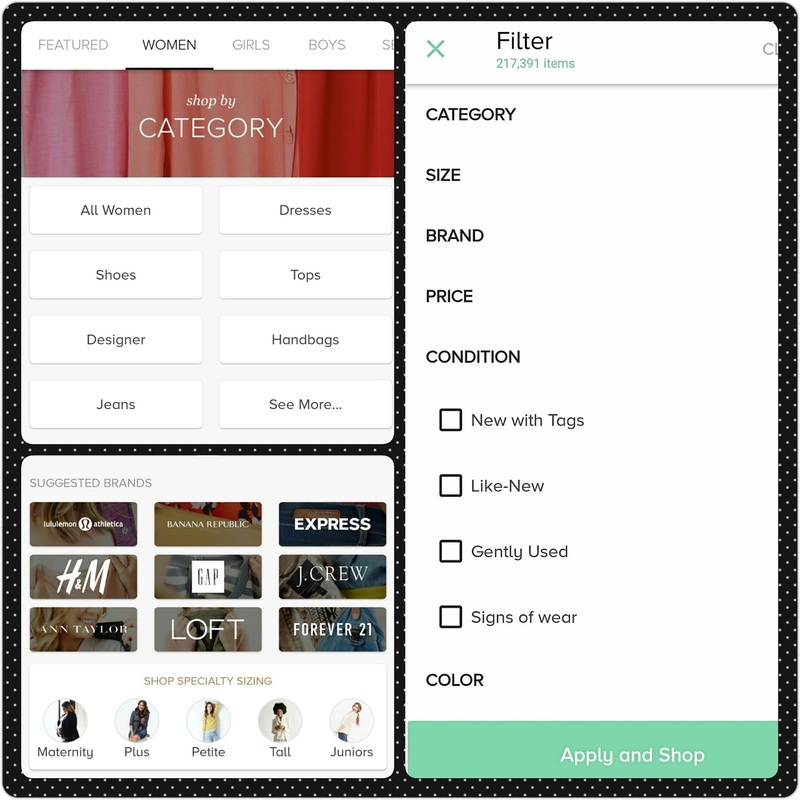 It works much like a “normal” store in that you can browse by category, designer, speciality sizes, etc. My favorite feature is that you can also browse by Condition. There are 4 choices, which include, “New with Tags”, “Like-New”, “Gently Used”, and “Signs of Wear”. So, if it weirds you out to buy used clothes, click the box that says “New with Tags” and you’re good to go! It will also save your sizes, so you don’t have to enter those in every time. The pictures I’m showing are all from the app, but it looks similar on the website as well. Once you find an item you’re interested in, it’ll pull up much like the screenshots on the left. The name of the item, the size, the current price, and the original price will all be listed below the picture. The item details will also be displayed along with other items you may also like. I love when websites or apps make suggestions. It’s a great way to do a quick comparison of like items. If you decide you may want to purchase the item, simply add it to your cart. You have 24 hours to buy it, which is also nice. Because it’s a thrift shop, I wasn’t sure if you would be able to hold items in that manner. Luckily, you can. For me, I like to fill my cart and then sleep on it to see if I’m still excited about the items in the morning. This is a great feature for people like me! 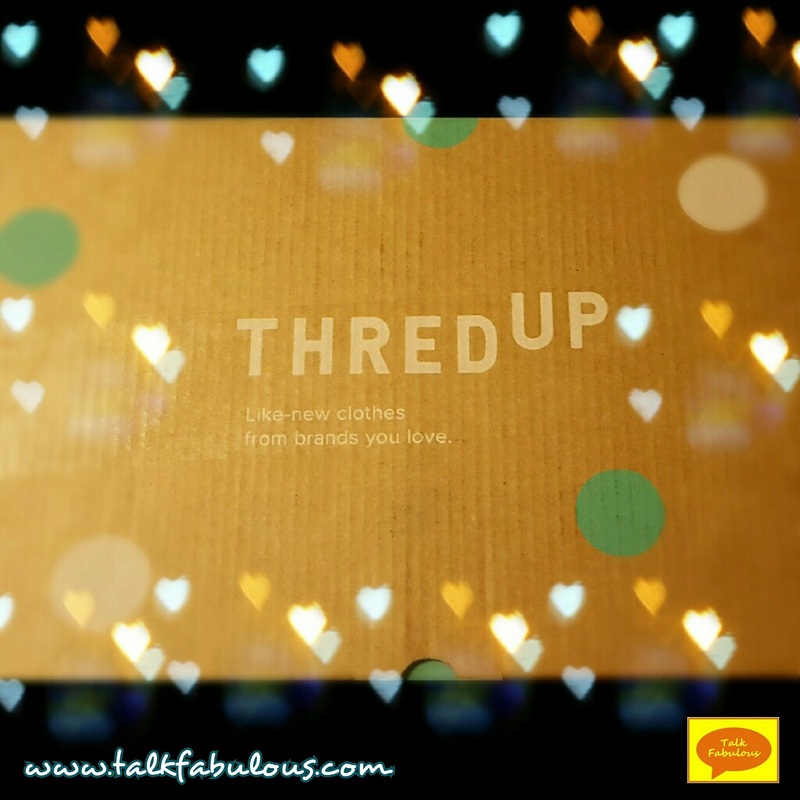 There’s a little about thredUP! 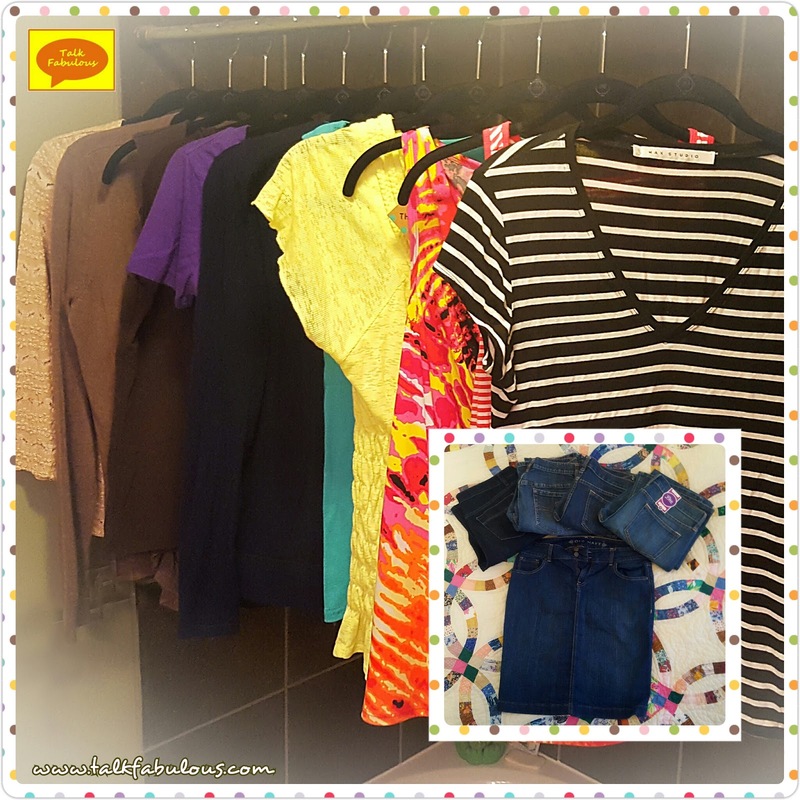 Stay tuned next week when I share my first thredUP purchases!